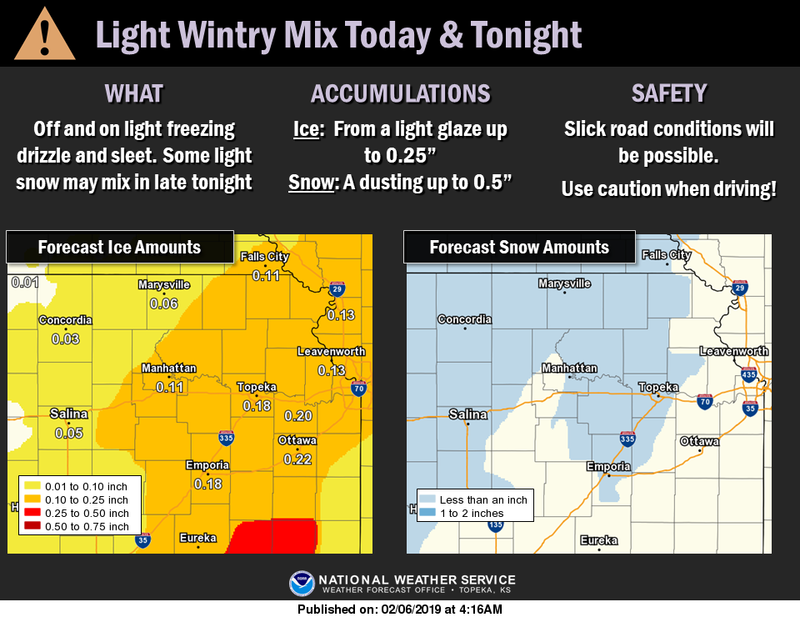 The National Weather Service late Wednesday extended a Winter Weather Advisory for Riley, Pottawatomie and surrounding counties until noon Thursday. The potential remains high for an icy, slick mix of freezing drizzle, sleet and snow late Wednesday into Thursday. Total ice accumulations of up to two-tenths of an inch are possible with this system. In fact, several counties further east toward Kansas City are under an ice storm warning until noon Thursday where higher ice accumulations are expected. A host of schools across northeast Kansas are already calling off classes Thursday as road conditions are expected to be treacherous. Motorists are reminded to not underestimate the impacts of even a light glaze of ice. Numerous car accidents and slide-offs have already been reported. Those who must venture out should use extreme caution and drive slow. Winds gusting as high as 35 miles per hour Thursday could also cause visibility issues with blowing snow. Dangerous cold wind chills are also possible from Thursday into Friday. Travel will be slowed once again today and tonight as the chance for patchy freezing drizzle exists for much of the region. The better chances for light accumulations of ice and snow will be Wednesday night. Chances for periods of freezing drizzle and sleet are possible through the daytime hours, possibly mixing with snow at times. At least two crashes were reported Wednesday morning after 7 a.m, including one at Anderson and Sunset Ave. in Manhattan and a rollover accident near mile marker 318 in the eastbound lanes of Interstate 70. The Riley County Police Department has initiated its Emergency Accident Reporting Phase due to the weather. During this period, if there are no injuries to involved parties, no hit and run, no DUI or no alcohol/drug related crime, it does not need to be reported immediately to officers. All accidents must be reported in the following 48 hours. Residents are encouraged to stay weather aware and take caution driving as roads will be slick. The National Weather Service is forecasting up to .11 inches of ice accumulation for Manhattan with areas south and east receiving generally higher amounts. A dusting of up to a half inch of snow is also possible. An Arctic cold front will blast through the area, bringing bitterly cold temperatures to the region both Thursday and Friday. Wind chills could be as cold as 15 below by Friday morning. 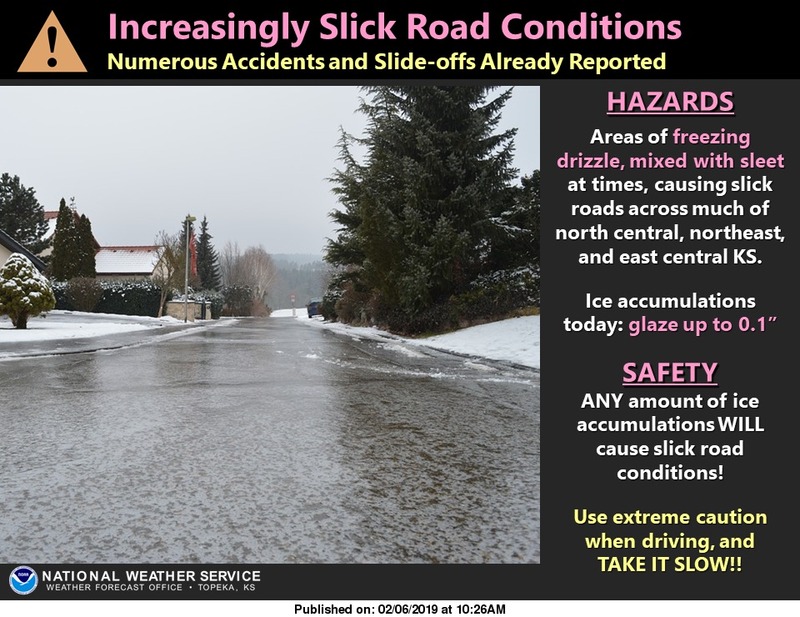 The post Icy conditions expected to cause slick roads throughout the region appeared first on News Radio KMAN.